The following quotes are from people who have taken the Future Directed Therapy course. W. Clement Stone in the 1960’s told us all we needed to have was a positive mental attitude. Now FDT has finally shown us how to find one. FDT is a real eye opener. Anyone who has lived in the shadow of fear should treat themselves to this course. This class is the creme de la creme. I enjoyed it immensely. I want to take the class over and over again. It is good, good, good. I came to my first FDT class as a depressed and unfocused person. I am leaving with a grasp of the way life’s situations and challenges can be confronted with the end result being a more positive life. I am looking forward to continuing my FDT experiences and furthering the development of my skills. I loved the group course! Dr. Vilhauer was great as a group leader and communicated the skills of FDT amazingly. Everyone can benefit from learning these skills. 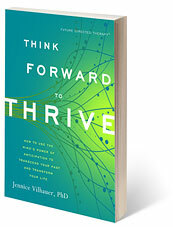 As a veteran of many self-help books and therapies, I found Dr. Vilhauer’s book to be unique in it’s ability to put forth a variety of tools to help me create a better life NOW. It is truly life changing and I plan to turn to it again and again. Thank you for helping me to understand that I can actively and positively influence the direction my future will take; I have already taken the first steps! The FDT class was enormously helpful in my daily life. I refer back to different areas of the book to help me through almost any problem that comes up. I am really learning how to live the life I want and it spills over to feeling better daily. FDT was an excellent program and a new experience for me. Most importanly I feel better since attending these classes. I’ve been able to control my anxiety and my depression. I am a whole other person. I learned that I have a choice about my thought process and that I create the future in every present moment of my life. FDT has changed my life and now I know who I am and especially what I want to do with my future. Thank you! I really liked these group classes. They helped me boost my self-esteem, and gave me more awareness about how important I am to myself. I now realize the only thing stopping me is me. I now have the tools to get more of what I want, and to abandon thoughts that are not leading me to thrive. This material was well presented and gave me an exciting and strong sense of possibility toward a positive shift. I am very grateful for this experience. FDT has given me keen insight into the way I operate. I now possess the necessary tools to craft a more desirable future for myself. Very Helpful! Looking forward to more. The material is unusually clear and well-written. It makes the unconscious-conscious. Dr. Vilhauer’s presentation skills are wonderful and the book is exceptional! *As is standard practice in the field of psychology, names have been removed to protect confidentiality. Copyright ©2010- 2015 FutureDirectedTherapy.com. All Rights Reserved.